The 2018 Siyaphumelela Conference is taking place from 12-14 June 2018 at The Wanderers Club in Johannesburg. The three-day event includes a number of workshops (Tuesday morning) followed by two and a half days of presentations and discussions centering on finding solutions to why students do not succeed at institutions of higher learning. The workshops address and tackle design thinking, strategies to address national challenges in Higher Education and development of an academic viability model for institutions of higher learning. 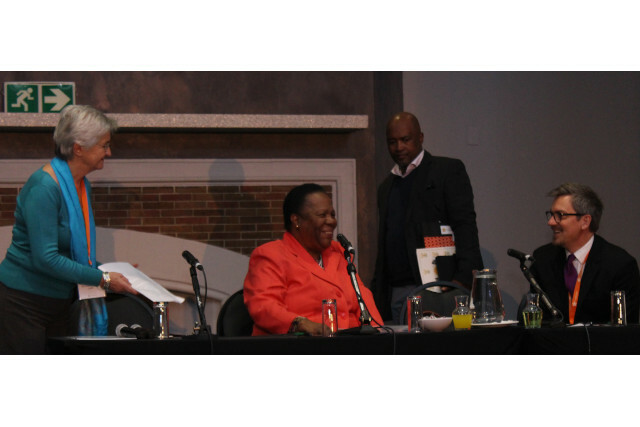 The conference was opened by Minister Naledi Pandor (Minister of Higher Education and Training) and in her address, highlighted the adverse effect student funding has on South African students. “Students who are inadequately funded experience great challenges in regard to food security, suitable accommodation, and ability to obtain textbooks and other resources. These tend to be poor black working class students we need to develop models of funding and support that address their needs. Government has chosen to introduce a full-cost bursary scheme for students whose family income is under R350, 000 a year,” said Pandor. But while Pandor remarked that she is optimistic about this new bursary scheme, she further highlighted that in addition to funding, students also need academic support. “Recent research on student expenses in our universities suggests much more work is needed to achieve transformation. While we are on an upward trajectory, we still need to improve throughput rates. We now have a collective responsibility in university education to ensure that most students graduate with a quality degree. To do this means taking responsibility for our students’ success. It means that we have to understand our student’s needs,” she said. The annual conference is a central aspect of the Siyaphumelela programme that is aimed at improving capacity at South African universities to use data analytics to improve student success. As such the annual conference aim to promote a national discourse on student success initiatives of the Siyaphumelela programme. Bill Moses Managing Director of the Kresge Foundation, the funder of the conference announced that the Foundation would extend support for the initiative for the next few years. “We need models of funding that fully support students and their needs. With student success, there is no magic bullet. No one consultant, one app, one solution. Student success has to be an approach — not a priority but the priority,” he said. International guests include Professor Sara Goldrick-Rab (Temple University, Philadelphia), Chancellor Kim A. Wilcox (University of California, Riverside) and Vice Provos Sukhwant Jhaj (Portland State University, Portland). As the only conference focusing on the use of analytics to promote student success in sub Saharan Africa, the conference provides a platform for international and local experts and practitioners to discuss evidence-based practices and national systemic interventions aimed at student success. Key people in attendance will be the VCs and DVCs of the five partner institutions: The University of the Witwatersrand, the University of Pretoria, Nelson Mandela University, the University of the Free State and the Durban University of Technology. Central themes that will be covered over the three days are: basic needs and student success, leadership for student success and design for student success. To view or download the full programme, please go tohttp://www.siyaphumelela.org.za/conf/2018/#! You can also follow developments at the conference on Twitter via #SIYA2018. For media accreditation or to arrange media interviews, please contact Silindile Nyathikazi on +27 71 291 9959 or e-mail silindilen@saide.org.za. For more information on the Siyaphumelela Conference and Saide, contact Executive Director Jenny Glennie on +27 11-403-2813 or email jennyg@saide.org.za. Saide offers a number of services across all educational sectors – higher education, teacher education, early childhood development, schooling, technical and vocational education and community education. We do not deliver education programmes, but work with educators, programmes and institutions as well as government to enable successful open learning for all. Visit http://www.saide.org.za for more information.